The Bloody Bone Cupcake recipe is not for the faint-hearted! How a little bit of red food colouring mix to some corn syrup can make it look like blood dripping! This cupcake recipe is definitely a fan favourite to serve at a Halloween Party. It’s a delicious chocolate cupcake with a butter cream vanilla frosting and topped with a gummy bone. Yummy! Combine 1 Cup of the graham cracker crumbs and melted butter and mix. Line the cupcake tins with paper liners. Preheat oven to 350 degrees. Mix the flour, sugar, cocoa, baking soda, baking powder, and salt in a bowl. In a separate bowl add the eggs, whole milk, and oil. Add the bowl containing the eggs, whole milk, oil, and vanilla to the bowl holding the dry ingredients. Mix all together until fully incorporated. Beat for 3 minutes on medium. Slowly add the boiling water starting with a small amount then pour in the remaining boiling water. The batter may be a little runny. Scoop batter into cupcake lined cups until 3/4s filled. Mix on medium speed until frosting doesn’t fall off a spoon. Place into a piping bag with a star tip and frost onto cooled cupcake. In a small bowl, combine the corn syrup and the red food dye, mix until combined. Take a fork and dip it into the corn syrup, drizzle over the cupcakes for a blood effect. Place gummy bone on top. 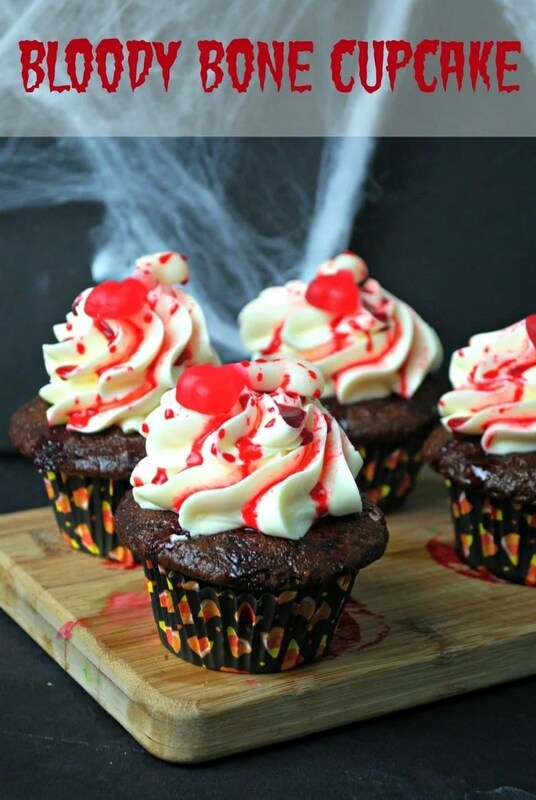 I hope you enjoyed my Halloween Bloody Bone Cupcake recipe! If you make it, make sure to share with us on Facebook or Twitter! Also, check out all of our other Halloween Recipes. I love these! omg how fun! This would be so great to make for my daughters class on Halloween 🙂 bookmarked! I can see this recipe making it’s way into my kitchen over the next few week… Halloween here we come!!!! Yay! Let us know how you like them! The bloody frosting looks super cool!! Wow, I’ve not seen a Halloween cupcake before that looks quite like these, creepy and yummy looking! I agree and it’s so delicious! OMGosh, these are great and perfect for the season. I will have to try them for the Halloween party at work. You will be the talk of the party! Those not only look good but sound delicious. A great cupcake for Halloween they look really good, I need my daughter to make me some!! Those cupcakes look awesome! The recipe sounds delicious too! These are spooky and perfect for the season!